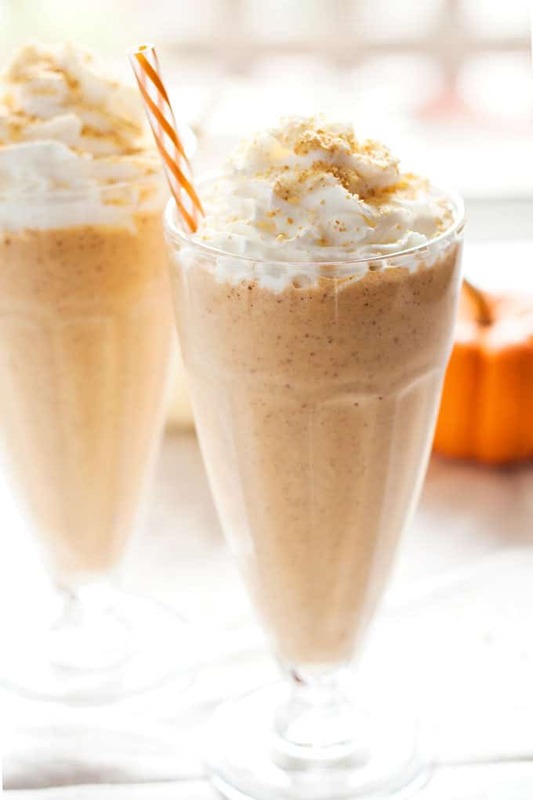 Enjoy the flavors of fall all year round with one of these pumpkin pie milkshakes! Top yours with whipped cream and some graham cracker crumbs for the perfect treat! You know how much I love my milkshakes. First I brought you my long-time love, the java lava crumbler. Then it was the toasted marshmallow peanut butter milkshake – decadent and delicious. I followed that by a delightful Nutella Ferrer rocher milkshake that is sure to knock your socks off. And now it’s time to embrace all of the flavors of autumn. I don’t know about you, but pumpkin pie screams fall to me. I start dreaming about it when people begin talking about pumpkin spice lattes and once Thanksgiving gets nearer… well, it’s all over from there. There is no stopping me from starting with dessert on Thanksgiving day. I know, I know – it sounds like I have a slight addiction. But pumpkin pie season only lasts for a few weeks and you need to take advantage of it. I thought about starting this pumpkin pie milkshake with a slice of pumpkin pie. That would be delicious, but if I have a slice of pie chances are I am going to eat just that slice of pie. 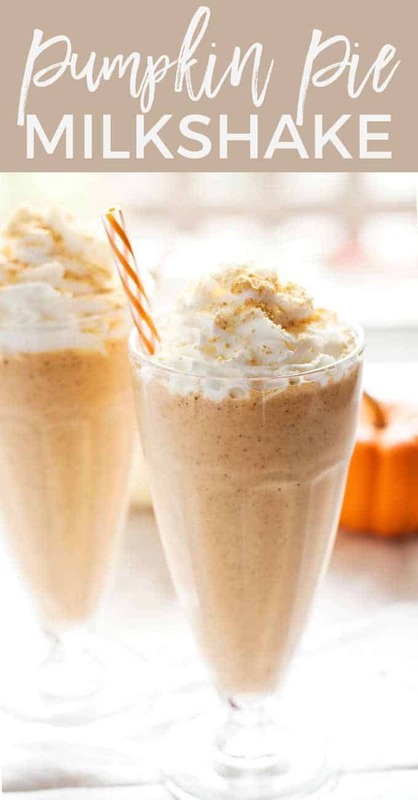 With that in mind, I set out to create a delicious fall milkshake that you could whip up at any time of year, should a pumpkin pie craving appear. Start with your favorite brand of vanilla ice cream. Add that to the jar of your blender, followed by your pumpkin puree, pumpkin pie spice mix and milk. If you have leftover pumpkin puree from any fall recipes, this is a great way to use it up! 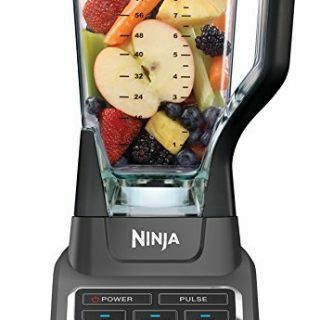 Blend that well until the shake is smooth. Then, turn off your blender and slowly mix in the graham cracker crumbs into your shake with a spatula. 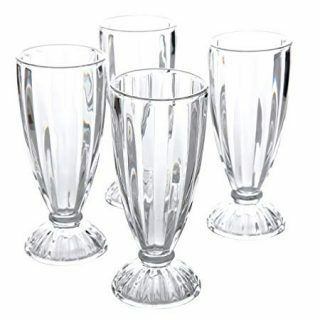 Pour the shake into glasses, top with whipped cream and sprinkle extra crumbs on top. Want to make your own pumpkin puree? Try this homemade pumpkin puree recipe. 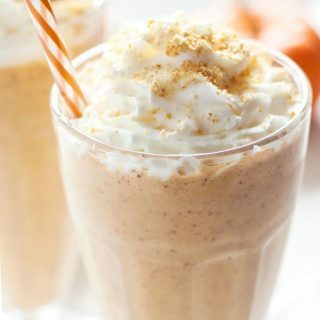 In a blender jar, combine the ice cream, milk, pumpkin puree and pumpkin pie spice. Blend until smooth. Stir in the graham cracker crumbs with a spatula. Pour into glasses and top with garnishes. That looks so tasty!! 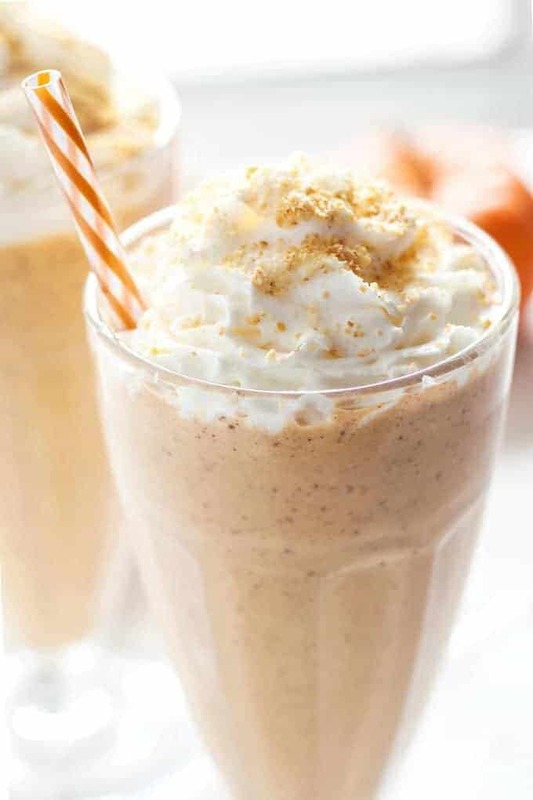 I am not a big pumpkin pie fan, but the milkshake format does look appealing. Great photo!! Pinned! Thank you Natasha!! I hope you enjoy it! Hi Charlie. .5 is half and .25 is quarter. 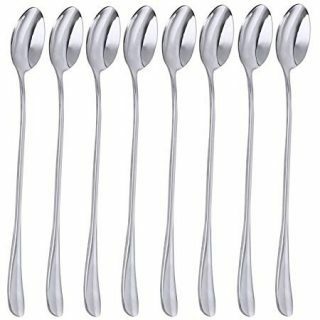 Each are cups. Sounds delicious! Thanks for sharing at the What’s for Dinner Link party!